Pour water into a medium-sized sauce pan. Add cherry-flavored gelatin and stir until combined. Sprinkle 2 envelopes unflavored gelatin on top. Let sit for a minute or so to let the gelatin activate. Turn on medium heat and whisk to combine. When gelatin is dissolved and water is slightly steaming (not boiling), remove from heat. Add 1.5 cups cinnamon schnapps or Fireball™ whiskey and pour into a lightly greased 9x13-inch pan. Place in the refrigerator 3 hours or until completely firm. 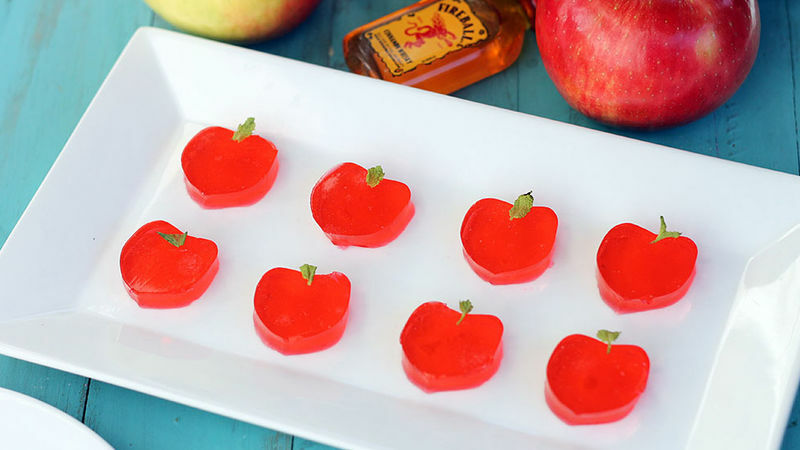 When completely set, use an apple-shaped cookie or fondant cutter to cut out 24 apples. If using a heart-shaped cookie or fondant cutter, gently squeeze the cutter and mold it to look more like the fruit than a heart. Gently lift out each apple with your hands or a mini spatula (carefully, so you don’t break the gelatin). Slice your mint leaves into smaller leaves so they look like stems. Arrange on top of apples and refrigerate until time to serve.